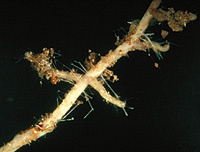 Rhizomorphs can be formed as stout, short, conical structures consisting of densely agglutinated hyphae and they originate mostly in rather steep angles at restricted points from the mantle and cause a picture like the leg of an insect. The terms 'frequent' and 'infrequent' are not strictly defined and are subject to personal experience. If there is any difficulty to decide whether 'frequent' or 'infrequent' should be used, enter both.